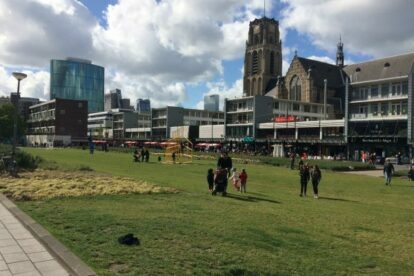 Next to the most iconic building in the city, the Markthal, lies a rare strip of grass. This field is the perfect spot to rest your legs after hours of shopping or to just enjoy the sunny weather. No matter the hour of day, the sun shines brightly on this lawn and therefore it is the ideal place to work on your tan. In the middle of this field are some funny sculptures that turn 3D once you look at them at the right angle. Besides that, the sculptures are a hotspot for Pokémon Go (yes I know that is so 2016). During warm spring/summer nights’ groups of primarily young people gather on the field to chill, listen to music and have some beers together. This creates a relaxed and chill atmosphere to get to know some new people. For me, it’s my favorite chill spot in the city center and you’ll definitely find me there during the summer. It is expected that construction of a large tower can start any minute, so enjoy it while you can.